I thought this US Open match was worth a full post. I was on court coaching during the actual match so I had to watch Karim Abdel Gawad and Paul Coll on replay when I got home. All squash fans knew this was going to be the match to watch and I always love people playing who have a contrast in styles. Tough draw for those guys and easily worthy of a semis or even a finals. Here's a few points I have on the match on the refs and why I feel the better player won on this night. Can having the best racquet skill in the world ever work against you? Does Gawad's gift make him less attentive to tactics? We all know Gawad has the best control and perhaps the best touch in the world. What he does with his racquet really is amazing; he makes the game look easy. In the first game I thought he was looking pretty sharp and confident. The announcers talked about how he liked to take out his opponent's legs by going short a lot early in a match. What I was watching was that he just didn't feel threatened when Coll was hitting from the front so he was shooting more than he would against a more lethal opponent. Coll has a nice counter drop, but has little no deception. I believe he was trying to put work into his legs and letting him run up and back to the T over and over. Gawad was volleying a lot, but most were going short. I know this is going to sound trivial, but I really felt like he had to play more length and set up the short game better. 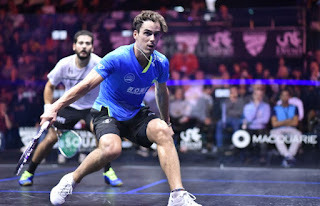 If you looked closely at where Coll was standing when Gawad was going short, he was often in front of him very high up on the T. When your opponent is that far up on the T expecting a short ball often the hardest movement is when they have to go backwards in the back corners again. Obviously when you do this your opponent also is not going to be able to put as much pressure on you as they scurry off to the back corner to retrieve an attacking volley drive. I really think this one slight change could have turned the match right around. Likely Gawad didn't want to get stuck into Coll's style of play and a more traditional type of squash and he wanted to open up the court and move the ball around, but going short that frequently, and often from behind your opponent is going to lead to some tins and a few shots being just off target which Coll could counter. Coll's attacking game is built on his counter punch where he uses his blistering speed to pounce on anything short. There's no doubt that Gawad can do things with his racquet that Coll can only dream of, but he demonstrated that if you don't need to have the best hands in the world to beat the best in the world. I know a lot of people are upset about the conduct stroke near that gave Coll match point. Here's my take on this. I thought a lot of the calls were shocking throughout the entire match. For the most part these two guys are quite clean and don't call many lets. The one area that bothers me is how Gawad only appears to really hustle to a shot or back to the T when he is either looking for a stroke or trying to provide some subtle interference his opponent must maneuver around. As he volleys from the midcourt short and Coll is right behind him he moves quickly back to the T making Superman have to go around him or ask for a 'let.' You never like to leave a decision up to a ref especially when they seem to have trouble with the rules. So in short, I can see why the refs were in that position to give a conduct stroke, but it didn't look like he ran that hard into Coll. If Coll didn't fall down would it have been a conduct stroke? If he didn't bump into him isn't it considered insufficient effort? What exactly is the appropriate amount of contact allowed or required to get a stroke in this situation? For now this interpretation is up to the ref and they thought it was excessive. It was such a crucial point and from thinking you were going to receive a stroke to being penalized a stroke is a tough pill to swallow. the match was pretty much over at that point. When the ball was hot and bouncy Coll seemed to be able to get all of Gawad's shots back. Changing the ball after the third game evidently favoured Coll and Gawad needed to slightly adjust his tactics until the ball began to slow down. It's interesting how something like the bounciness of a ball can have such an impact on the outcome. Why is it in the rules that players can only ask for a new ball after the third game? Why at all? Why not after every game? Did the best squash player win? On the night, yes I believe so. The player who demonstrated superior tactics and made less errors prevailed. But I do think Gawad's racquet skill are second to none, but that doesn't always mean you're going to win if you don't get the tactics just right. So although he is probably feeling hard done by the ref's I think he only has himself to blame for being in that position. If he played a little patient I think things could have worked out differently for him. Unfortunately couldn't catch this one but thought that conduct stroke wasn't warranted there. Definitely seemed Gawad wasn't up to the task anyway. One thing I noticed with some of the more athletic guys that don't have the most deceptive games (like Coll, Salazar, some of the lesser known British players) is that they play straight volley drops when they get the chance and rarely go crosscourt. Seems like Momen is onto something with his signature shot. It might open the court up if it's not hit well but it does force the opponent to to the longest distance on court and more often than not wrongfoots people into either a bad shot or a winner. Just a thought I had watching some of the action. Love the posts. If I remember correctly, Gawad had two conduct warnings about this earlier in the match, so it would be expected, from a refereeing standpoint, that the third incident would result in a conduct stroke, regardless of the juncture in the match where it occurred. Nevertheless, the question raised about how to show sufficient effort to get to the ball in such situations is a valid one. How about "breathing down your opponent's neck?"